My Summer Survival Action Plan is in full swing. With temperatures already in the mid 90’s, and high humidity, it’s time to hit the road running. Literally. 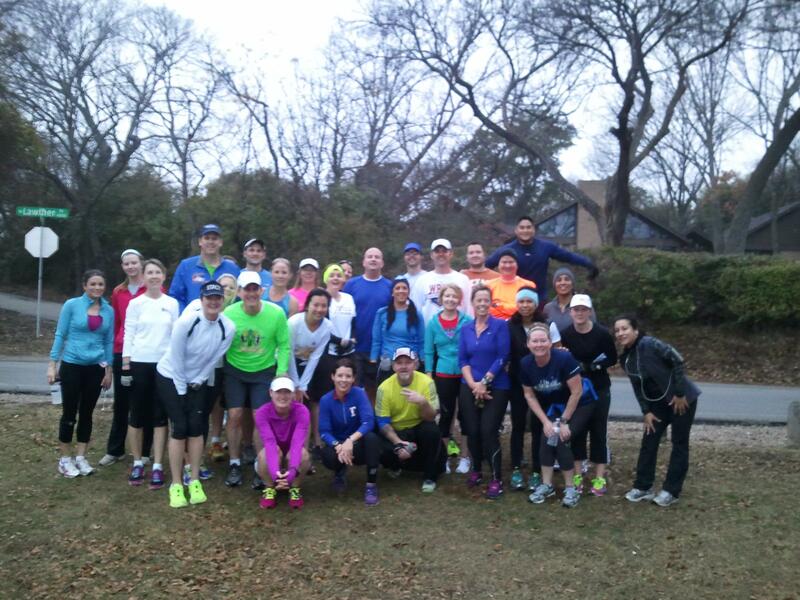 Saturday’s group run took us on the northern section of the White Rock Creek Trail. The entire length of the trail is approximately seven miles, and we’ve run the southern section quite a few times in the past few years. This was the first time most of us had run the northern part. It was very humid, but the cloud cover kept the temperatures nice and low. The 6:30am start also helped. Soon, the intense heat will force us to start even earlier. Most of us are between races and are taking it easy with shorter mileage until we start training for our fall races. My training officially begins this week. Yikes! The northern part of the trail was a nice change. I enjoyed running on a path where I never had to worry about cars. It was also nice to see flowing water in the creek, a result of rain earlier in the week. It will be dry as a bone in a few weeks. Some sections were shady, some not so much, and except for some cyclists and a few runners not part of our group, we had the trail almost all to ourselves. The nicest thing about Saturday’s run was running with old friends who have since moved on to triathlons and other running groups. One of these friends was Kurt, a runner young enough to be my son who calls me “Running Mom.” He had just moved to Dallas when the group I was pacing met him at White Rock Lake one Saturday morning about four years ago. He had stopped at a water fountain and asked if he could tag along with us on the rest of our run. He ran about six more miles with us to the finish, huffing and puffing, impressing all of us since he had just recently taken up running. He does anything but huff and puff these days. He’s a lean, mean athletic machine–and a great conversationalist on a run. And that’s what it’s really all about, isn’t it? Running, talking, laughing, and being there for each other. I love that I can run with people twenty years younger than myself and it makes no difference. Out on the trail we’re all just runners, enjoying the experience–together. Saturday’s long run was a humid mess of moistness. The temperature started out at 73 degrees, but with the humidity at 78% it didn’t seem all that cool. The worst was the way the air felt so thick. I could tell what a difference it made after our weeks of humidity in the teens. Bill surprised Heather and me with an autographed copy of a new running book by Adam Goucher (aka Mr. Kara Goucher) and Tim Catalano called Running the Edge. We squealed like little girls and couldn’t wait to get home and read it. I seriously considered ditching the long run so I could start reading the book. Before I could think twice, we were off, headed towards our usual route down to the lake. The mornings are definitely darker now, and I thought about remembering to wear light colored clothing from now on. We ran along the lake for a couple of miles, then headed up out of Lakewood. Heather, who battled a cold all week and was running under the influence of Sudafed, said we were running too fast for the start, and she was right. We paid the price the last few miles. They were torture. After Lakewood, it was a new route through familiar neighborhoods: M Streets, Katy Trail, and Highland Park (where the police were obligingly parked and watching us from their black SUV to make sure we stayed on their sidewalks). We continued around the country club, through University Park, through SMU campus, past the Katy Trail for water, then back up the dreaded hill at Longview, then Anita, to Fuzzy’s. The humidity was brutal and the route felt like we were always running uphill, but it was nevertheless nice to run a new route. I was so glad to be done. Why aren’t these long runs getting any easier????? Heather, Bill, and I all decided that next week we are going to start off much slower and then pick up the speed as we go along. We’ve been saying this from the beginning . . . Afterwards, over tacos and beer, Chris pulled out his boxes and we all purchased and tried on our new WRRC (White Rock Running Co-op)/RUN FREE tech shirts. It will be way cool to wear them in the future. The club is slowly growing, and that’s a good thing. *** Just now looking at the weather stats for Saturday, I noticed the humidity level actually went up from 78% to 85% by the end of our run. One more reason, perhaps, why the run was so difficult . . .